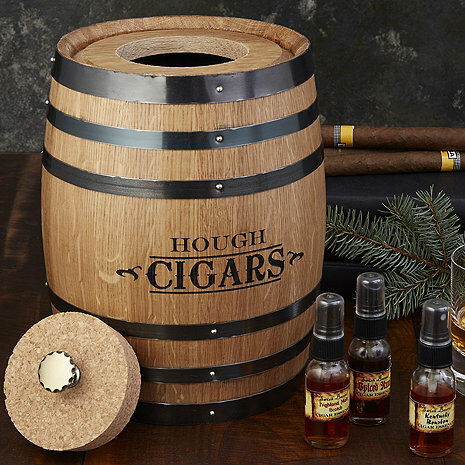 Cigar Humidor Barrel An oak barrel that infuses cigars with the flavor of their favorite spirits. Just moisten the staves with the whiskey, scotch, bourbon or essence of choice and give the cigars a few days to soak it all in. Simply spray the essence in the infusion barrel, enough to wet and be absorbed by the barrel staves. Place your favorite cigars in the barrel and close the top. Allow a minimum of 2 days in the barrel and the cigars will absorb the flavor of your spirits. How many cigars can this hold? BEST ANSWER: The 2 Liter Ciger Barrel will hold 2 cigars. How many cigars does the 5 liter hold? 15 plus the humidor stuff you add, my son loved it! It holds 40 - 50 cigars. Will this hold fluid, similar to the wine & whiskey barrels on the site? I was thinking this might be good for making brined pickles in. BEST ANSWER: It could I guess, it seals the air tight in the barrel. We don't put any fluids in our so I am not sure if it would leak or not. No. It is strictly a humidor for cigars. Not suitable for liquids. This is made for cigars and not suitable for food and fluids. The 2 liter only holds 2 cigars ?? The 2 liter Personalized Cigar Infusion Barrel Humidor holds about 12 cigars. does it include stand as pictured? BEST ANSWER: I do not see any stand pictured as this barrell stands up. Beautifully crafted barrel. Engraved mine and it is deep, almost as if it was burned into the barrel. Great quality barrel.